Since the first Breakfast With Fred Leadership Institute event in 2008, over 60 leading men and women from eight states have joined together to “stretch and bless the next generation of leaders…to the glory of God.” About twenty team members travel to and attend each BWFLI campus event. 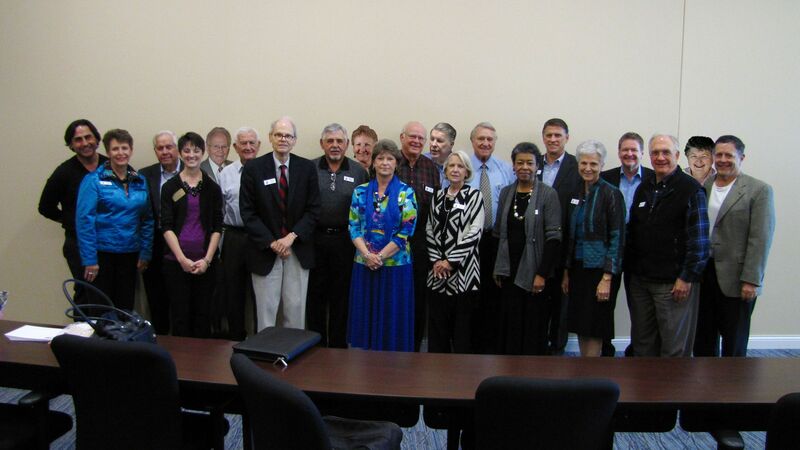 Shown at right are the group of team members recently attending East Texas Baptist University. Click on any underlined name below to see brief information, photo, etc. of our BWFLI Team roster. Ask a Question of many of the Team members by naming them on our Contact Us page. Al Angell is retired as owner of Angell Financial Group. Member of board of trustees of Yorktown University. Serves on board of Free Market Foundation. Involved in planting churches, private schools and recreation center for South Dallas Ministries. Earned AB degree from Harvard University in 1963. Jim Hailey retired as President of the women’s wear division of JC Penney. Strong background with the Salvation Army board in Dallas. Jim Beckett is President of Beckett Interests, Dallas, TX He is a statistician, author, editor, and publisher. The company he founded, Beckett Publications, is well known in the hobby of sports card collecting. He serves on ministry and community boards. He hosts SHINE, a ministry incubator. JJ Prendamano is a man of vision, energy, and accomplishment. His corporate, executive background merges well with his passion for entrepreneurship. As General Manager of United Franchising Group, he leads the initiatives for franchise development, communication, and growth. His program at Palm Beach Atlantic University encourages student entrepreneurship through mentoring and grants. John Begley is the President Emeritus of Lindsey Wilson College. He will be the Chapel speaker. He was a host member of the steering committee for our Institute at LWC April 2011. Joe Petersen worked in Development, Construction and Marketing in the real estate housing industry. He is President of the Dallas Multifamily Builders Council and Chairman of the Multi-Housing Council for the National Association of Home Builders. Focusing his efforts on bringin together Christian CEOs and business owners in a peer advisory board titled “C12”. Hartzel Black is a former Vice President of Southeastern Illinois College. As a Leader in Correctional Education, established correctional programming in 20 prisons throughout the world. Developed “Success for Life” program for Management and Training of inmates. Thomas Jones (Tommy) is active in the Banking, Finance and Oil industries in Texas. He has been CEO and President of Canyon Resources, Synergy Oil and Gas, Citzens National Bank of Dallas (Frost Bank), National Bank of Commerce Dallas and others. He is active on the Boards and committees of many banks, universities, and Christian organizations including First Baptist Church of Dallas. Dr. Ramesh Richard is the founder and president of a global proclamation organization, reaching leaders worldwide, especially those of Asia, Africa, and Latin America. He is an inspirational speaker, spiritual philosopher, renowned educator, and practical author who speaks on the ultimate issues of life to thousands of people around the globe each year. Marilyn Kasko is a Divisional Vice President (Corporate Real Estate) for Abbott Labs. She was with Electronic Data Systems (EDS) for 20 years prior to Abbott. She has served in leadership positions for both charitable and civic organizations in Texas and Illinois. She is the recipient of the ATHENA Award for her demonstration of excellence and support of other women in executive goals. John Brooks retired as a self-employed dairy/crop farmer in Central Ohio. He and his wife Linda serve as international part-time missionaries, as well as volunteering for Joni and Friends. He graduated from Ohio State University and served as an Army officer. Linda Brooks is committed to her family, and contributing to the cause of Christ wherever she serves. As a volunteer for Joni and Friends, she and her husband John have delivered wheelchairs internationally, hosted open houses, and developed an area corn maze. Her love for Bible study, missions, and Christian outreach impacts her daily living. Gary Kinder is a well known Sales Management consultant to more than 300 companies around the world. Graduate of Illinois Wesleyan University and Trustee Emeritus. President of the Fellowship of Christian Athletes and the Kidney Foundation of Texas. Chairman of the Board of the Bill Glass Evangelistic Association. Started the Roaring Lambs Bible Study over 30 years ago. Bill Krisher is a two time All American in football at the University of Oklahoma and two year All Pro with the Dallas Texans. He works with the Fellowship of Christian Athletes organization and Weekend of Champions events. Bill is Chaplain for the Dallas chapter of National Football League Players Association. Jim Shaw is retired from working as Senior Warden and Regional Director at the correctional facilities of the Coffield Unit and Terrell Units in Texas with up to 28,000 inmates. He also worked as National Director of Prison and Jail Operations at a national private correctional management company overseeing 21 facilities. Ron Cunningham is the Principal Inspector/Emergency Management Coordinator-Los Angeles Housing Department (Retired). He teaches building construction at Pasadena City College. He is an ordained deacon, certified coach, speaker, and teacher on the John Maxwell Team. He is working on his Masters in Biblical and Theological Studies. Verdell Krisher is a speaker, author, teacher, retreat leader, grief counselor, and writer, and seemingly, lives her life in a state of “permanent change.” After being widowed for 15 years Verdell married Bill Krisher and blended their two families of 5 children and 10 grandchildren, ages 10 to 27. She is author of Let Me Grieve, But Not Forever now in its 10th anniversary edition. Vicki Shaw worked for 17 years with the Texas Department of Criminal Justice. In retirement, she persues her love of music and is active with the Quitman Community Theatre and Holly Lake Community Theatre. Bob Deffinbaugh joined bible.org in 2013 where he seeks to produce and acquire top quality biblical materials for the Website, and to encourage others in their study, application, and proclamation of God’s Word. He served as teaching elder of Community Bible Chapel for over 40 years. He is a graduate of Dallas Theological Seminary, and Seattle Pacific University. Cliff Shiepe is a best-selling Author, Founder and Creative Director of Cliff Falls Media, Inc. Appearing on NBC, PBS, LA Times Festival of Books, and speaking engagements across the country. Graduate of the University of Southern California. Began his career in production at the Walt Disney Company. Krish Dhanam joined the Zig Ziglar Corporation and served as Vice President of Global Operations. Personally trained by Zig Ziglar, Krish has delivered his message of hope, humor and balance in over 50 countries and throughout the US. Cofounder of training company, The American Dream from an Indian Heart. Published several books and is a global adjunct with Ravi Zacharias International Ministries. Brenda A. Smith is the President and CEO of the BWF Project, Inc. and the Breakfast with Fred Leadership Institute. Officer and management positions in The Principal Financial Group, Northwestern Mutual, and Manulife Financial. Owned a printing and office supply company in Dallas, TX. She is an author of several books. Brenda has degrees from Ohio State University, Vanderbilt University, and professional designations (CLU and ChFC) from the American College. Joe Dion serves as a State Farm agent in Fayetteville, Georgia. He has shown leadership in financial services for 29 years in companies such as State Farm, Allstate Financial, MetLife, Principal Financial Group, and New England Life. Joe is a five-time qualifier for the Million Dollar Round Table. Carolyn Stonehocker is a retired Educator in Music for junior high and high school in Kansas, Iowa, and Illinois. Serves on the board of Media Associates International. Holds a B.Sc. in Music Education from Kansas State University, M.A. in New Testament from Wheaton College. Keith Stonehocker served as the Chief Strategy Officer for Christianity Today International, working for 38 years in circulation, marketing, new product development, digital publishing, strategic alliances, and international partnerships. Hold a B.A. in English from University of Saskatchewan, an M.A. in Communications from Wheaton College, and an M.Sc. in Management from National Louis University. Bill Dotson founded Dallas Real Estate Ministries (DREM). He is committed to the influence of Christian faith in the marketplace. He is an author of books on fathering, and revival history in America, speaker, and President of Abiding Fathers, a ministry focused on strengthening families. Jack Turpin is retired as Chair of Hall-Mark Electronics and is active in Hall-Mark Energy Co. He founded T-Bar M, a tennis resort and Christian Retreat center in New Braunfels, TX. He served as Chair of the Dallas Theological Seminary board for 10 years. He is the author of Beyond the Bottom Line. Tanya Magnus has a diverse career of sports (golf, professional bowling), business, and ministry. She has experience with Fortune 500 companies, music, and entrepreneurship. She is the founder of Choose To Soar ministries, as well as Road Warriors for Christ. She is a published author, featured speaker, and accomplished Bible teacher who is known for her outstanding communication skills. Kat Van Dusen leads the Katalyst group as a Sales Director for the Mary Kay Company in the Chicago area. She is a business coach, teacher, speaker, and was an operating room coordiantor at McNeal Hospital in Berwyn, IL. Peter McNally is the Founder of Purpose Growth Partners which provides marketing and consulting for national companies like Pepsico, Frito-Lay, Taco Bell, Walmart, Walgreens, among many others. Peter works with senior executives and their organizations in the areas of marketing strategy, innovation, and organization development. Peter is the architect of the “CMO of the Future” initiative with 32 years of marketing and management experience. Pat Walters serves as a Breakfast With Fred board member and is highly-valued for all areas of the organization. She retired as one of the top producing regional directors for Manulife Financial. She is an avid Golfer and instructor. Bill Glass is a four-time All-Pro NFL champion, Author and engaging speaker. As a sought-after speaker and motivator, he has a packed schedule around the nation and overseas. Bill graduated from Baylor University and Southwestern Theological Seminary. He played pro football with the Detroit Lions and Cleveland Browns. At the urging of Billy Graham, Bill started his ministry “Champions for Life” and he is energetic in his ministry to prisons and other areas. Mark Modesti worked with a Fortune 100 company for 25 years in Sales and Customer Solutions. He has held a variety of positions in Operations, HR, and Industrial Engineering. Dan Williams is the Founder and President for Your Life Matters and a professor of Organizational Management at Biola University in Southern California. He appeals to the students for his candor and ability to create almost instant rapport. Larry Wayne Morbitt thrills audiences throughout America and Europe with his resonant voice. His recognized roles include Ubaldo Piangi in the Phantom of the Opera companies on Broadway, Las Vegas, and Switzerland. In addition to his theatrical career, he has served as Minister of Music and concertizes for Christian events nationally. Colonel Rich Goldsmith is a US Army retired serving 30 years in Vietnam, Germany and US bases. After retirement, Rich was a Navy civilian teaching leadership to senior naval officers. He was Director of Strategic Initiatives working with Officers’ Christian Fellowship in Englewood, CO.
Craig Morgan is a National Sales Director for Primerica. He and his wife Gina are founders of Blended Together Forever. They are speakers and authors on helping two families from divorce or other circumstances become one healthy family and enjoy their new life together. Jack Murphy is a motivational speaker, serving businesses and ministries with a message of hope and redemption. Murphy’s background includes early musical success, athletic prowess, crime, and incarceration. His life changed when he believed the saving story of Jesus. He and his wife reside in Florida. Sue Goldsmith is a Wyoming native who has a B.A. from the University of Wyoming. She is married to Colonel Rich Goldsmith and served in many leadership roles as an Army wife. Sue is the mother of three children and helps others in raising Godly kids. Ed Yates is a graduate of North Texas and UT Law School. He practiced law in Dallas for 13 years before assuming the leadership of Highland Park Cafeteria. He has served on the board of directors of numerous business and Christian ministry board. He has been a member of the Breakfast With Fred Leadership Institute teams. He serves as a deacon at First Baptist Church, Dallas. Sandra Gray has been President of Asbury University since 2007. She served as Provost and faculty member. Her emphasis on international business has enabled students to experience global business environments. Prior to Asbury, she worked in the Lexington, KY banking industry. She is active on boards and committees serving the academic and business community. Hal Habecker is Senior Pastor of Dallas Bible Church. He served as Executive Director of the Christian Dental and Medical Society for 14 years. Hal is a graduate of Dallas Theological Seminary, Denver Seminary, Taylor University, and grew up in Hershey, PA. He and his wife Vicki have three grown children.